Judas Priest frontman Rob Halford says that upcoming album Firepower features some of the band’s best-ever work. The 2018 Rock And Roll Hall Of Fame nominees will release the follow-up to 2014’s Redeemer Of Souls early next year, with the first leg of a world tour already confirmed. 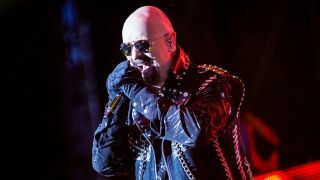 VintageRock.com caught up with the vocalist on the red carpet at this week’s Loudwire Music Awards, where Halford spoke about the new record – and praised guitarist Richie Faulkner’s work on the album. Halford says: “This is what Priest lives for. We’re a hard-working metal band still making the metal 40-odd years later thanks to our glorious metal fans around the world. “So we make music now, obviously, still for our own pleasure and enjoyment – and the challenge of finding a new riff and a new melody is a great feeling. “We came off the Redeemer Of Souls tour, had a break and then we dove straight back into the second record with Richie. And it’s Richie’s moment, really, because when we did Redeemer Of Souls, it was his first time with Priest as a writer. Further album details will be revealed in due course. Find a list of Judas Priest’s confirmed 2018 tour dates below.